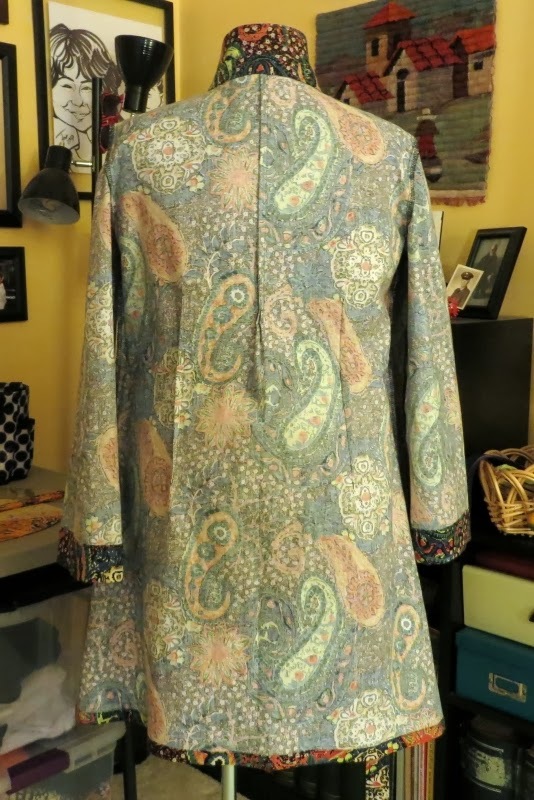 What a charming tunic! I’m really excited about this – it just feels right, and it’s so refreshing to sew a woven fabric for a change. All those knits have been wonderful, and I’ll definitely do more. 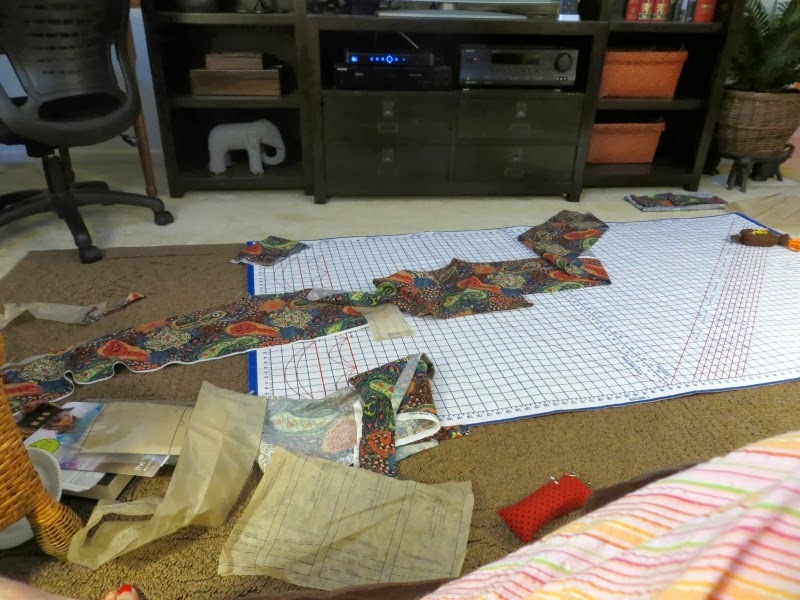 But I think I need some bright prints in my life right now – time to sew out of the cotton stash. 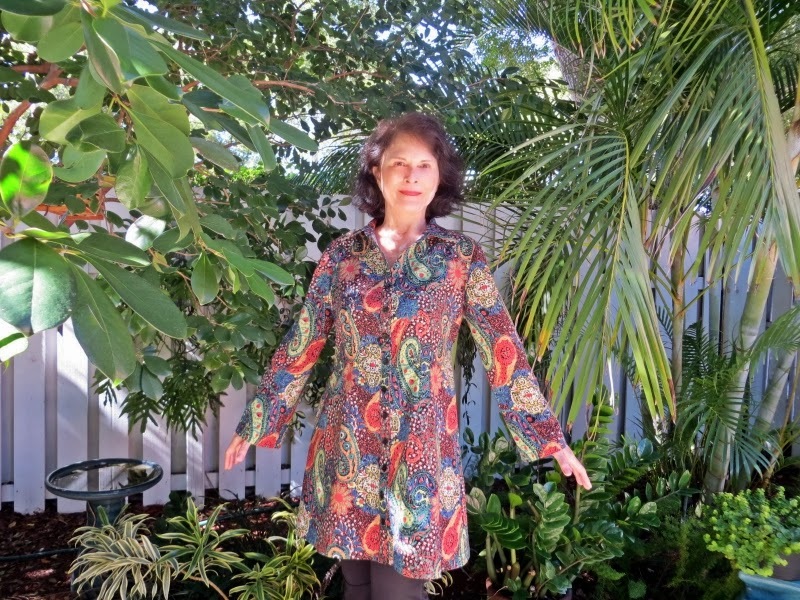 I’ve seen this tunic many times on the web, mostly in shops that sell indie patterns. But it just didn’t speak to me. 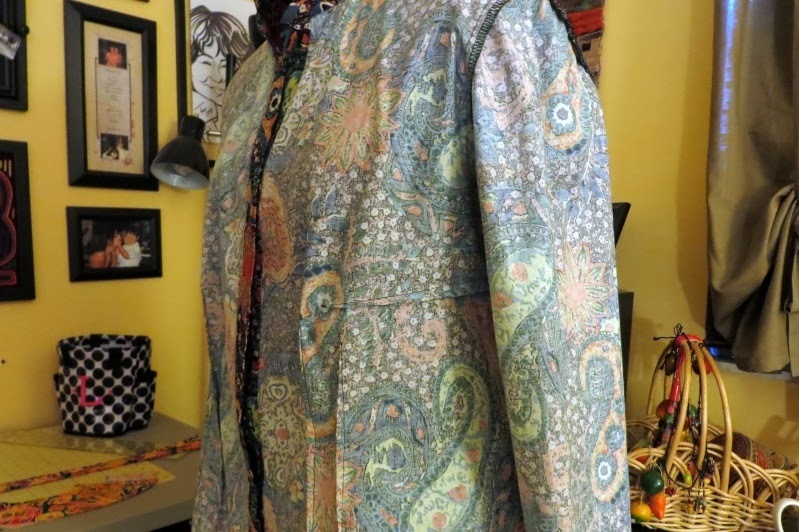 Then a short time ago I was reading Kimp’s blog, Cotton Creek Sewing (a recent find and I love her blog and her sewing) and found her two versions of the Liverpool. Sold and sold! So pretty. 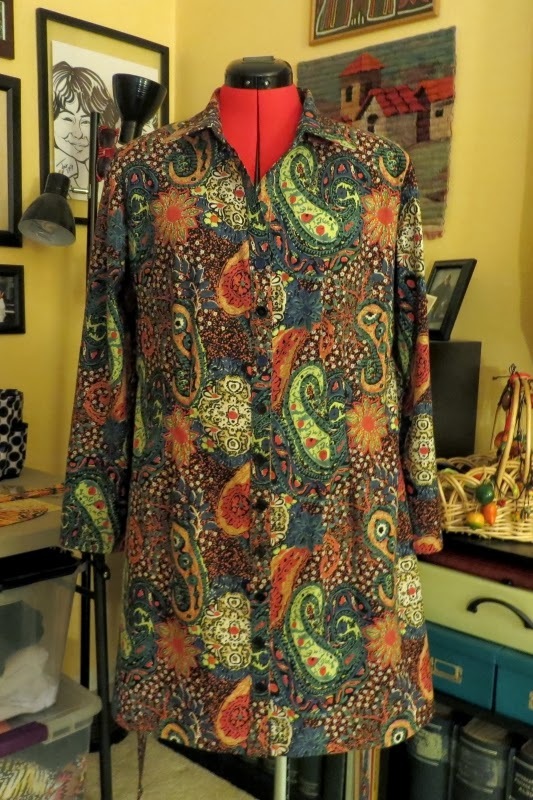 The pattern has 4 hem lengths (shirt, tunic, short dress, long dress) and 4 cuffed sleeve lengths (short, elbow, 3/4, and long). It also has a belt that attaches above the waist in the side seam and looks best (IMO) tied in the back. There are side bust darts and double vertical darts in the front, and a set of vertical darts in the back. Very nice shaping details. The front is closed with a full-length buttoned placket that opens into a collar stand and pointed collar. I’ve been saving this fabric for months – it’s so pretty I really did not want to cut into it. Do you ever feel that way? 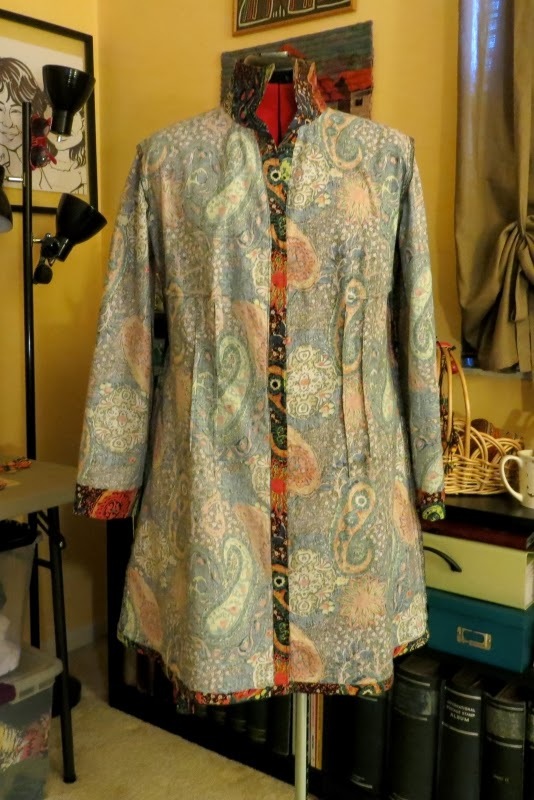 It’s JoAnns Legacy Studio Morocco Paisley, 100% cotton. Strangely, one is advised to dry clean. ummm. I pre-laundered in cold water and dried on delicate, and it looks beautiful. No running or fading. 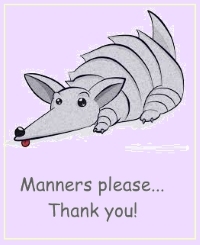 There are a number of reviews of this pattern on Pattern Review, and they were really helpful. And I found support for my disappointment with the pattern directions. Just not well written, certainly not up to Big 4 quality. 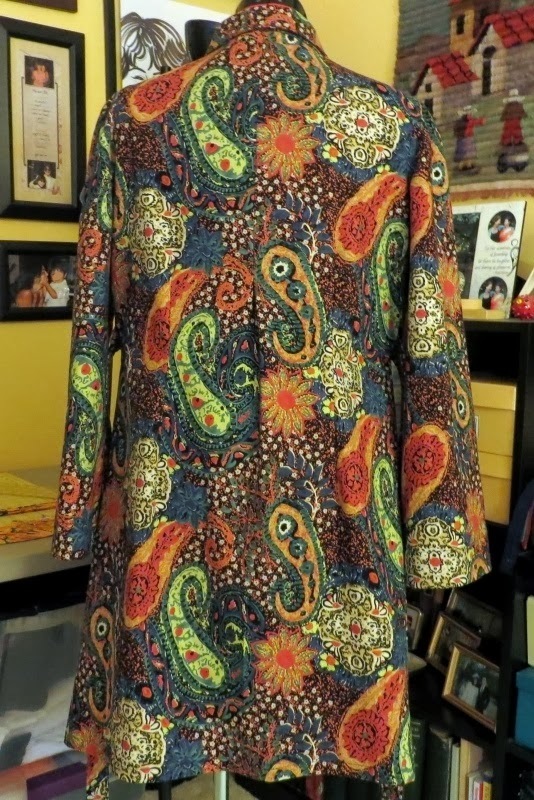 Which might make this tunic a little trying for some sewers. 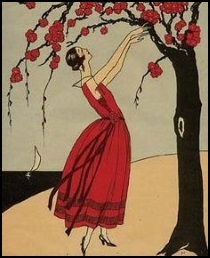 E.g., there are NO fitting marks with the exception of one marking the shoulder of the sleeve. And there are NO suggestions to trim seams, not even the ones inside the collar and collar band. 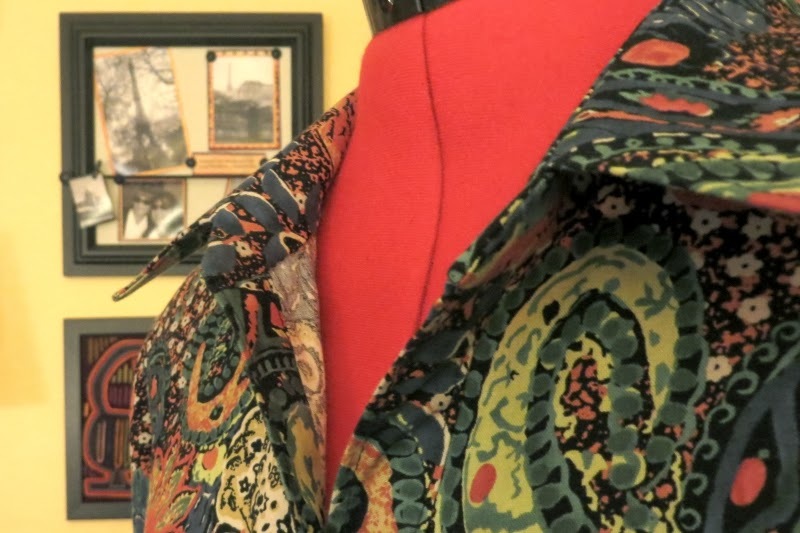 The collar piece that you interface will be your under collar (it goes on the bottom of the collar). The collar band piece that you interface will be the outside collar band (it goes on the back of the collar band and marries up with the under collar). 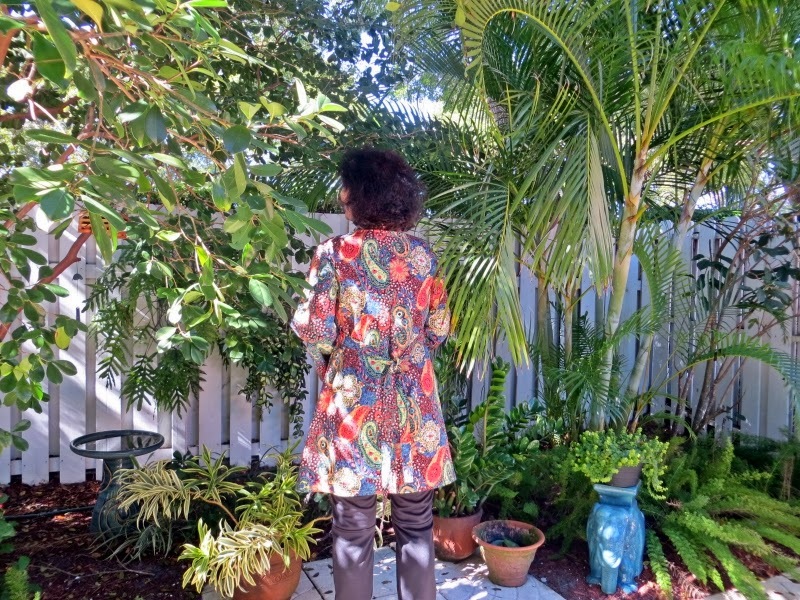 I sewed a size Large in this tunic – a Medium would have fit me, but very closely, and I like my clothes to be on the loose side. While the directions were a little funky, the pattern pieces were great and fit together really well. I shortened and narrowed the back vertical darts in the same manner, but did not move them down. One little change I made to the design is in the center back seam. I cut the back on the fold and then sewed the french seam down from the neck for 12 3/4″. And left it open to the bottom. Just a little something different, and I like the way it looks. 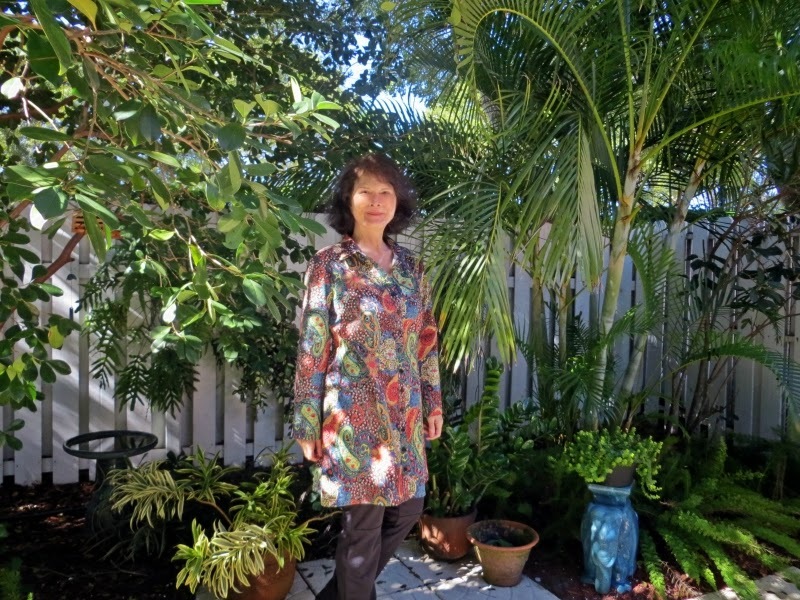 I also altered the long sleeves to get more of a caftan look. I just redrafted the sleeve pattern straight down from the armhole to the hem, making it the same width along its entire length. 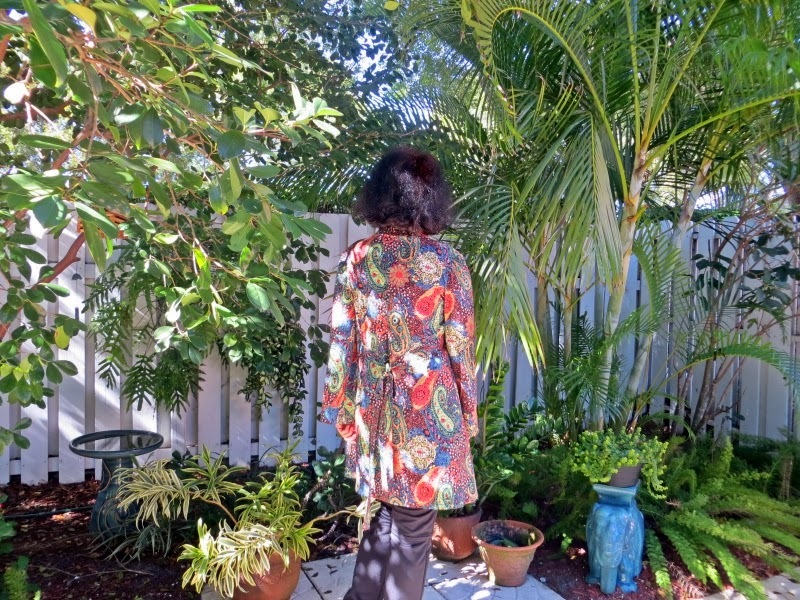 The hem is turned under 2 1/2″ so that any peek-a-boo into the sleeve shows the print instead of the wrong side of the fabric. No cuffs. Speaking of wrong sides – I fell right into this boo boo. 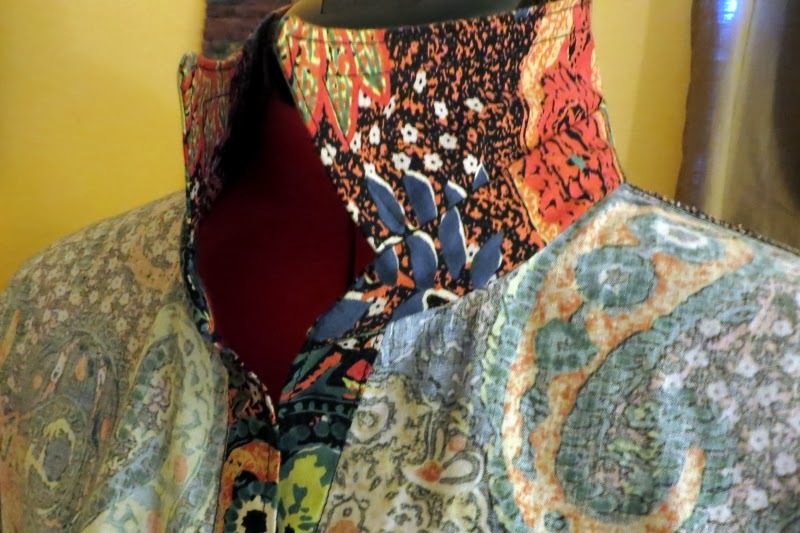 The front placket goes straight into the collar band, the collar turns back, and one sees the wrong side of the fabric at the neckline. It’s not awful, but it won’t happen again! My next version will have a facing construct under the collar band. Picky picky. So cute! Kimp mentioned that she cut 5 inches off the ties on her 2nd version, and I’m with her. The ties are a little long, especially since I knotted them (not a bow person). This was such a fun sew that I’m already working on my next one. As long as my living room is a mess, might as well keep going.